Recently I've come to fully embrace my style of cooking as not fancy, not involved and certainly not time consuming because at this point in my life there just isn't enough room for those adjectives. I want food that's simple to prepare with good ingredients and relatively quick to make. I'd love to sit here and tell you that I can do it all but the truth is I can't. I have to navigate the world of a 2 year old, a 5 year old and make food that adapts to all the nuances that go along with being a parent to the 2 of them, while also keeping myself on track, food wise and otherwise. Oh and I also have a full time job, so yeah fancy food, not on my to make list for the time being. This may change in a few years but for now, I have to adapt to my environment. So if you feel me on the quick, easy and delicious, high five! But while my style may be on the uncomplicated side, it nonetheless has to be gut friendly, contain real ingredients and above all taste good. So whenever possible, I try to sneak in superfoods that pack a nutritious punch. Enter collagen. If you haven't made the magical white powder your friend yet, you're missing out on serious goodness. Collagen is one of the most powerful supplements you can take. While I'm a big proponent of receiving nutrition from food, I'm absolutely on board with collagen. If you want an in-depth post on collagen, check this one out. While taking collagen is easy for me as I just add it to my tea or bone broth, it's not as easy to get my kids on to take it. 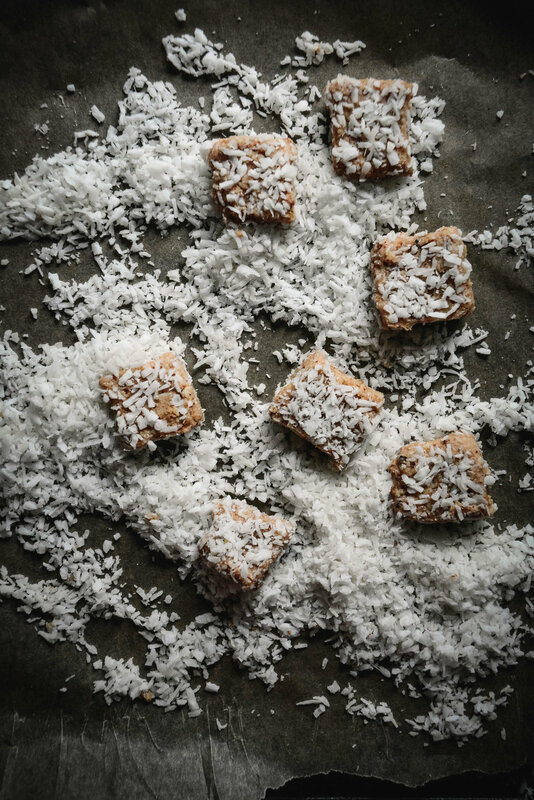 So I decided to make these simple vanilla collagen coconut bites that ensure they'd easily get a dose of goodness in the form of a treat. I also wanted them lower in sugar so the only sweetness comes from 3 regular dates (not Medjool as they're bigger). They're also packed with good fats which keep you feeling fuller, longer and are excellent for combating the afternoon slump. The combination much reminds me of a healthy-fied version of Ferrero Raffaello, which I used to have quite the weakness for growing up. All you need to make these happen is a food processor, a bunt cake pan and about 30 minutes of patience. Add all ingredients to food processor and blend until ingredients are fully incorporated. Spread mixture evenly on the bottom of bunt cake pan and let chill for at least 30 minutes. In pan, cut the hardened mixture into bite size pieces and coat with additional flaked coconut.